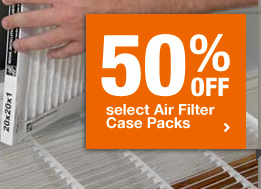 I spotted a nice deal from Home Depot for cases of Air Filters at 50% off. I confess, in asking my husband what we should order, I realized I didn’t know much about air filters at all. After seeing that the price for a case of 12 can vary drastically from $17 up to $100 or more, I spent some time researching how to get the most bang for my buck. Do you have any tips for how to choose an air filter?